I open with this quote because it so aptly describes the events that began in the art world long before the outbreak of the second World War. Hitler’s dream of a pure Germanic Empire included works of art and he determinedly set about purging those pieces he considered unsuitable. What was unsuitable? Works that were “unfinished” or abstract, that did not depict reality. Vasily Kandinsky. Works by Jews. Camille Pisarro. Works by leftists. George Grosz. Degenerate art they were called and exhibitions of them were set up to show the German people what not to like and admire. 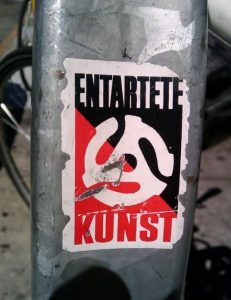 Shows like “Entartete Kunst” in Munich in 1937 drew thousands. Hermann Goering was one of the first in Hitler’s regime to recognize the commercial value of some of these works of art and amassed thousands of works for his own personal collection. His “agent” took Van Gogh’s “Portrait of Dr. Gachet,” purged from a museum in Frankfurt, to sell in Holland. The painting eventually found its way to New York and was sold for $82.5 million. Alfred Rosenberg, a Nazi ideologue, set up the ERR, the Einsatzstab Reichsleiter Rosenberg, to systematically collect – confiscate or steal, to be more precise – works of art and artifacts from state museums, citizens and Jews, in particular. Millions of pieces. As the war came to an end, the Allies closed in. With them were a handful of art-specialists called “monument men.” Their job was to locate and salvage these precious works of art from Germany, Italy and France. Every day these officers would find thousands of pieces on the verge of destruction. They saved what they could; still many disappeared through looting. The fate of thousands of objects is still unknown, even today. One of those precious pieces is the subject of my book, Deadly Provenance. 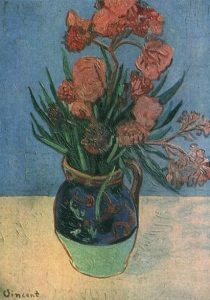 It is Van Gogh’s painting, “Still Life: Vase with Oleanders,” which vanished in 1944. Was it destroyed or is it hidden in someone’s secret art collection? In someone’s garage waiting for a sale, perhaps? Will it ever surface to please the world once more? Can science and technology assist in authenticating the painting if ever it is found? And if so, will it be restored to its rightful owner? Provenance will tell.